My kids in the kitchen, years ago. 2. Use a sturdy stepping stool. Standing on chairs just isn't safe and sitting on the counter is awkward at best. A good step ladder with a rail that stands behind your child is a real must. You could also use a kids' "kitchen helper," like this one. 3. 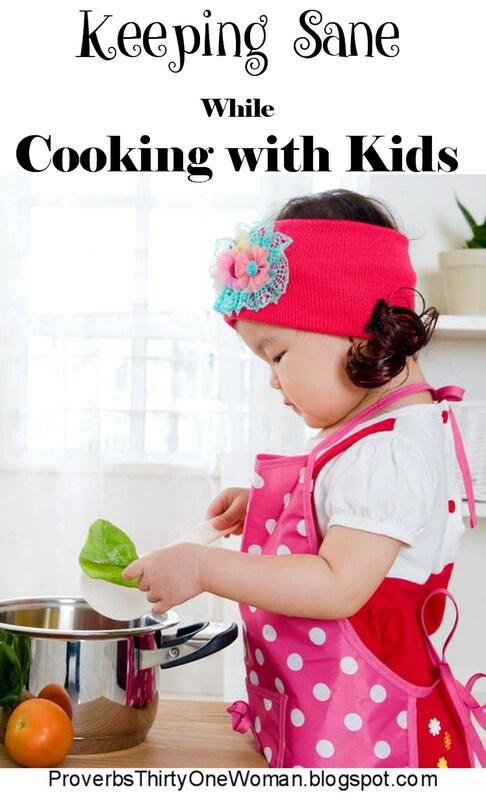 Don't let your child cook on the stove until he is truly ready. Some kids won't be responsible enough for this chore until they are teens; most experts suggest waiting until at least age 10, yet some kids are responsible enough at a much younger age. When you do finally let your child use the stove (or add or remove things from the oven), give him a heavy, quilted apron, good oven mitts, and a long handled spoon (wooden, so it doesn't transfer heat) for stirring. And always, always, always supervise. 4. Avoid teaching your child new cooking techniques or recipes when you're in a rush. Keep the stress level low by doing these things when you have more time to focus on "kid cooking." 5. Keep kitchen chores age appropriate. Children don't like it when you end up doing most of the work. In fact, it can really turn them off to cooking - and doing chores in general. Make it clear that there are some things in the kitchen only adults should do, but make sure they feel their jobs are important, too. 6. Sometimes make it all pretend. Although most parenting magazines suggest letting toddlers and preschoolers stir things in bowls, the stirring motion isn't especially easy for young kids and if there's much in the bowl, it may take more strength than they have. Make it easier for your children by giving them their own mixing bowl with just a little bit of the ingredients inside it. 7. Let 'em wash. Most preschoolers can learn to thoroughly wash veggies. If you have a salad spinner, this tool will keep kids even toddlers happy. 8. Let' 'em throw it away. Young children like to throw things in the trash (or kitchen compost bin). Again, it's an easy job that makes them feel useful. 9. Let 'em grab it. 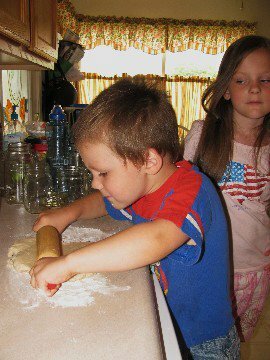 Young children can usually grab items from the fridge or cupboards - which keeps them busy while you attend to tasks (like chopping) they can't yet do. 10. When you finally allow your child to do some cutting, start them off with a plastic serrated knife, like this one. Leave the real knives for their teen years. Cute mini pies my kids used to make. 12. Give children too young to cook a drawer in the kitchen filled with safe things like plastic cups, a wooden spoon, and a small pot you don't mind letting them bang. You can keep preschoolers on up busy by having him set the table or make butter. Toddlers on up can also "wash" plastic bowls in the sink or sit on the floor with a colander and try to stick uncooked spaghetti through the holes. All these things keep your children busy in good, learning pursuits, while also keeping them nearby and out of your hair. A version of this post originally appear in April of 2010. I have 4 children under 7 y.o. so I KNOW about children helping in the kitchen. My 2.5y.o. says constantly "I do it". So they are every day in the kitchen helping me and I am trying NOT to pull my hair out. LOL I am thinking of establishing a day for each child to help and then when we do a special project, like baking cookies or a cake, everyone gets to do it together. One task that I have given them that they can do and it helps me is to pick up the chopped vegetables from the cutting board and put them into a bowl. They get to see me cutting the vegetables and learn by watching and still feel they are doing something because they get to move the vegetables to the cooking pan. This is a great list! Well done. I LOVE cooking with my kids, but because they're so different, our kitchen can be quite crazy at times. :) My son (4) prefers to "do dishes" while my daughter (7) is all about the culinary techniques.